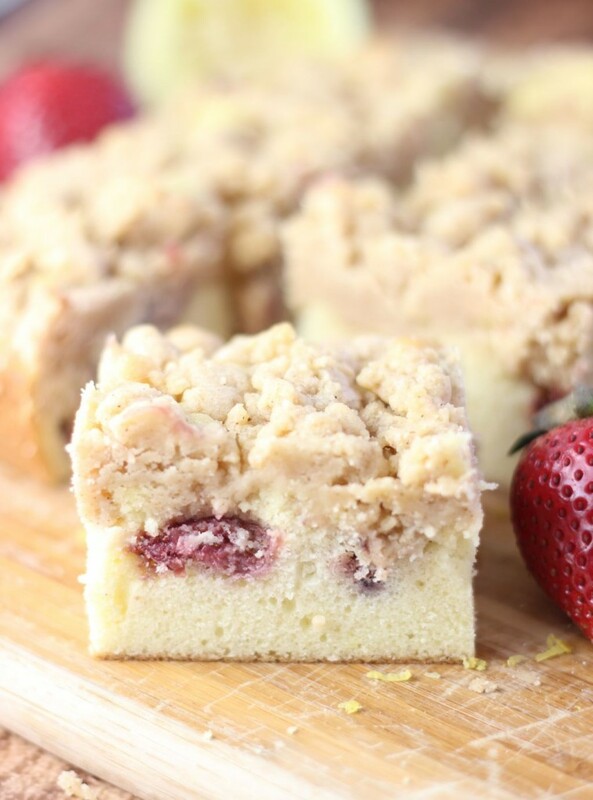 Roasted strawberries, lemon zest, and a lemon glaze, all come together in this tender crumb-topped coffee cake! 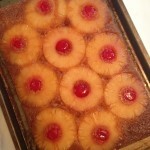 This recipe is one of the last few summer remnants I have lined up. It’s only early August, but August starts to feel like summer is over and fall is on the way. Fall is not actually on the way in Florida for about 3 more months, but I still like to pretend. Bath & Body Works joyously has all of their fall candles out and I burn through a large one every 3 days. The fall candles are my favorite so I will be stashing them like acorns. So it’s almost time to say goodbye to fruity summery recipes. 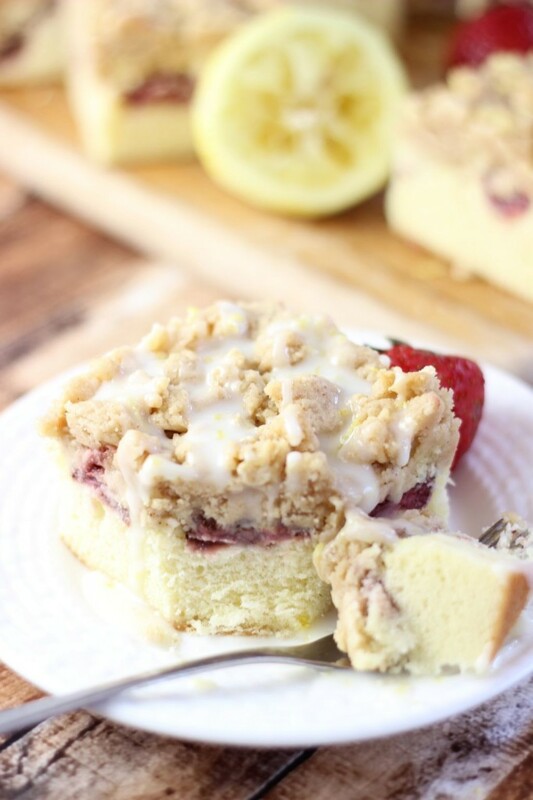 Before we do, this coffee cake is a nod to a favorite summer flavor: strawberry lemonade. For some reason, this has been the year of failed coffee cakes for me. I think every single attempt in 2015 has resulted in inedible swill. I couldn’t handle the thought of another failure so I turned to America’s Test Kitchen this time around because I know I can trust them not to let me down. No shame in my game. I *needed* coffee cake, but I couldn’t face another recipe disaster at the time. Nope. No more. The ATK crumb coffee cake is phenomenal. 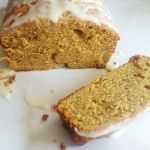 Topped with loads of cinnamony and buttery crumbiness (which sounds like a bad thing, but in this case is a good thing). 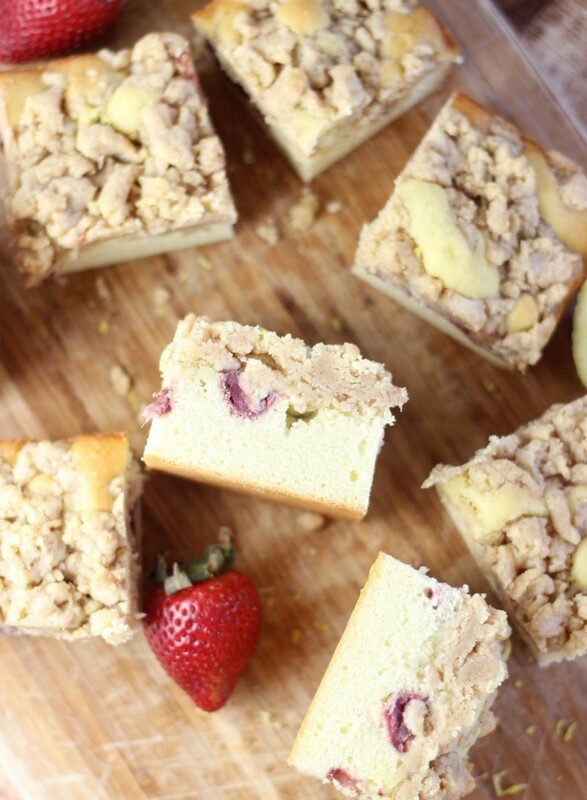 Basically the entire top half of the coffee cake is crumbs. The cake itself is buttery and dense, but tender. It’s literally perfect. No words (none that I’m equipped with anyway) can adequately express how amazing this coffee cake is. It’s a must-try. 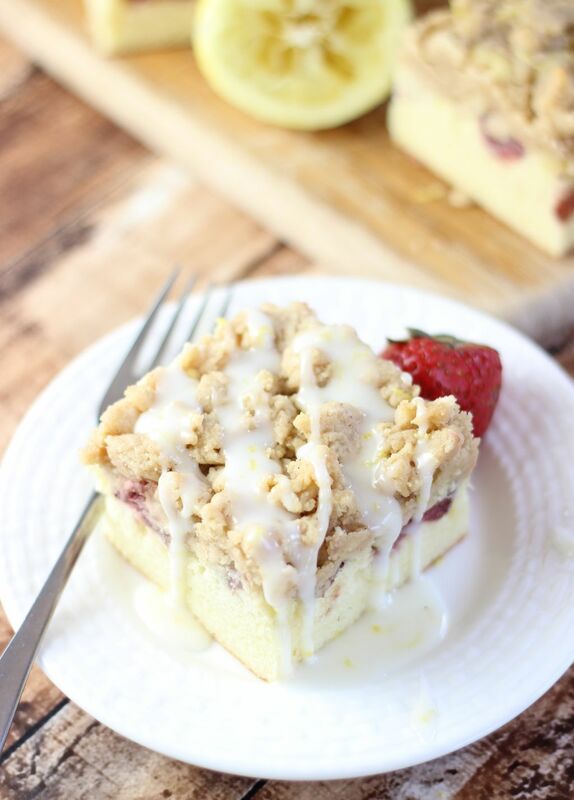 Strawberries in baked goods are not the best. Unless roasted, they get kinda mushy and the flavor isn’t as intense. Roasting them intensifies their flavors and helps them hold up better during baking. They also release the most incredible sweet juices. 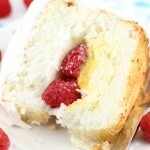 Lemon zest in the batter gives the cake a punch of fresh citrus, and a tangy lemon glaze tops it off. 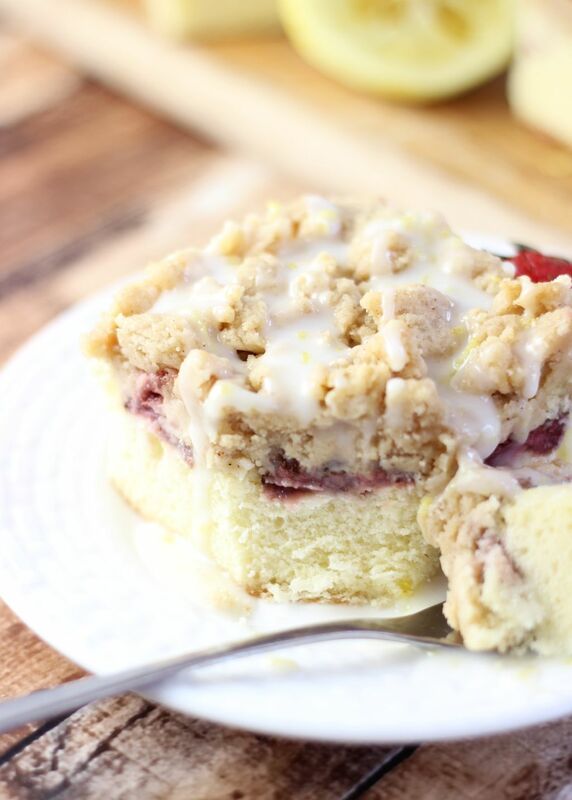 This coffee cake was blessedly anything but a failure. #phew. 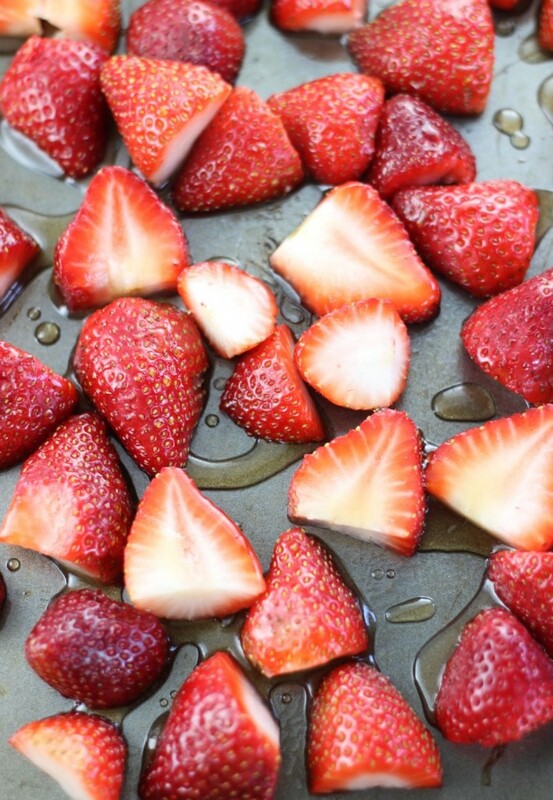 In a small bowl, combine strawberries and sugar, tossing to coat. 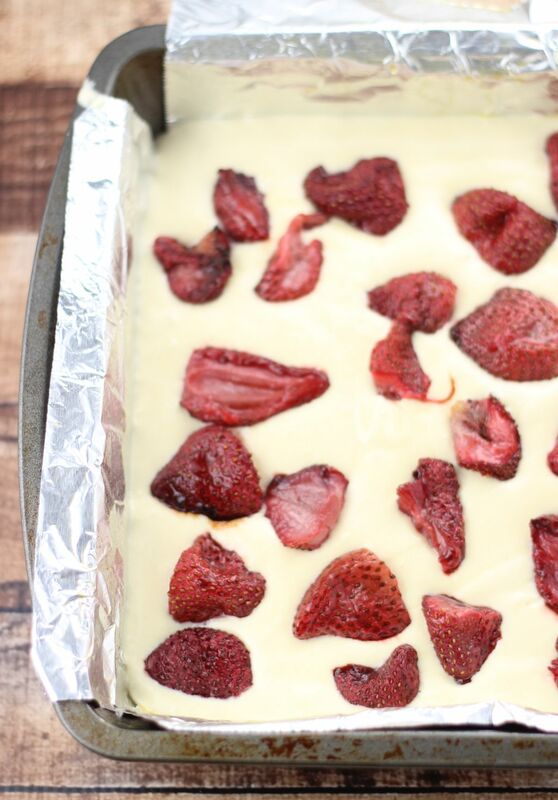 Scatter the strawberries on a well-greased or parchment-lined baking sheet. Bake at 350 degrees for 30-35 minutes, or until strawberries start to dry slightly at the edges, and they release juices. 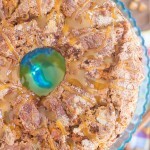 Remove from oven and allow to cool on the pan while preparing the coffee cake. In a medium bowl, whisk together melted butter, granulated sugar, brown sugar, and cinnamon. Add flour and stir with a rubber spatula or wooden spoon until it resembles a thick, cohesive dough. Set aside to cool to room temperature, about 15-20 minutes. In a large mixing bowl, combine cake flour, sugar, baking soda, and salt until blended. With mixer running, add softened butter 1 or 2 pieces at a time. Continue beating until it resembles coarse crumbs, 1-2 minutes. Add buttermilk, egg, yolk, and vanilla, and beat at medium speed until light and fluffy. Transfer to an 8-inch pan lined with foil (hanging over the edges) and lightly greased. 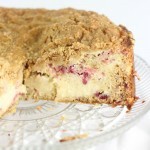 Transfer the strawberries to the coffee cake batter, scattering them across the top, and swirling lightly with a knife. 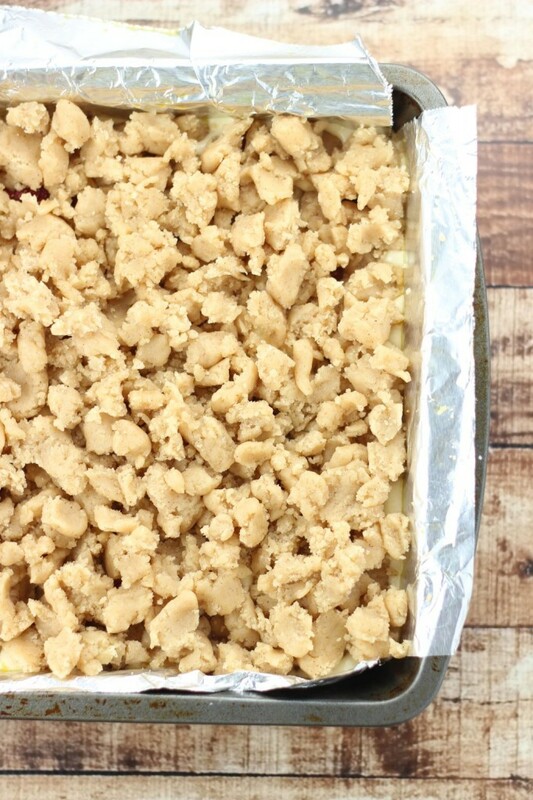 Break apart the crumb topping in pea-sized pieces and spread them into an even layer over the batter, working from the outer edges to the center. Bake at 325 degrees for 35-40 minutes, or until crumbs are golden and a toothpick inserted near the center comes out clean. Cool on a wire rack for at least 20 minutes before carefully removing the cake from the pan by the foil lining. Cut into 9 pieces. 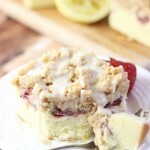 Serve warm with lemon glaze. In a small bowl, whisk together lemon juice and powdered sugar, adding powdered sugar until it reaches desired consistency. What a unique flavor for coffee cake and such a summery one! Love the roasted strawberries! 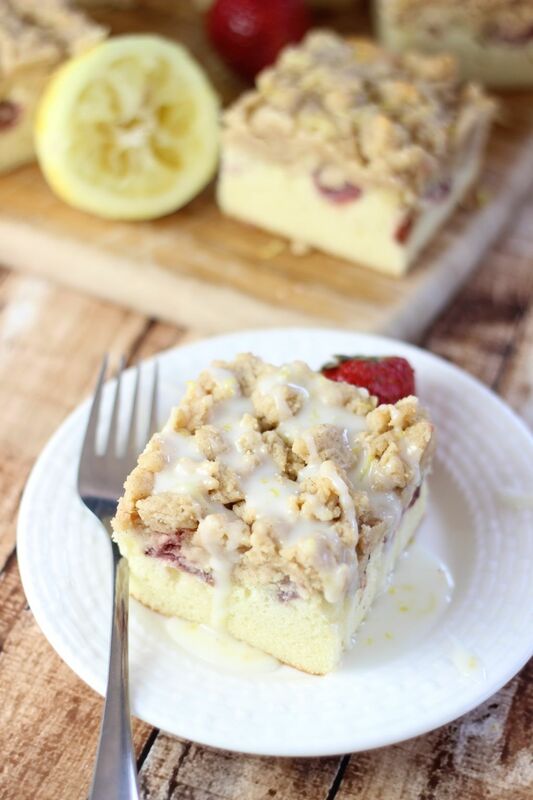 Love the strawberry lemonade flavour in this, it sounds like an amazing coffee cake! Using a springform cake tin cuts the hassle of having to use the foil to remove the cake! In my case I used an 8 inch one that did the job perfectly! I also absentmindedly forgot to use the egg and yolk in the coffee cake but the result was still absolutely delicious! Most certainly not a failed attempt this time. Wow this looks good. I am sad that summer is almost over. Your photos are so pretty. You do an awesome job! Thank you so much for the party and the pin!